The Internet of Things (IoT) played a huge role in helping Public Service Electric & Gas (PSE&G) use data to do active asset management. In 2001, the company began a plan for a computerized maintenance management system referred to as CMMS. The point of the plan was to create a system that uses active condition-based management (CBM) that can help forecast equipment failures before they happen. For the last 14 years, the PSE&G found the program helpful in performing the right maintenance at the time it is needed. Physical assets of PSE&G connect to more than the Internet. They also connect to other machines on the grid, as well as other systems and people monitoring the system. Also, their assets become smarter as software and analytics are now often used to check asset conditions. This plays a key role in keeping the utility running with less downtime. All the information flowing into other systems causes great amounts of data to be gathered—this is the Internet of Things (IoT). But too much data is as bad as not enough data – much of it is not relevant or redundant. To use the data effectively, a great analytics program is needed. One issue PSE&G is working on is determining the length of time a substation transformer remains useful. Each minute, the transformer analytics sends to operators key measurements about things such as top oil temperature load, fan loads, and cooling loads. The information is then analyzed and used to optimize maintenance of equipment. The cost of monitoring the utilities grid and equipment is falling as more suppliers make sensors embedded in their equipment, ending the cost of using more expensive third-party sensors. The new equipment is more reliable and less expensive – exactly the result hoped for when PSE&G began its CMMS program. They enjoy the same benefits as 80 percent of companies that invested in IoT: increased revenues. A smart grid offers other benefits to utility companies, such as detection of energy theft or loss, outage management, an efficient balance between energy demand and supply, and improved demand response. Utility companies can promote smart, programmable thermostats that can be accessed by smartphones, allowing customers to adjust their thermostats to a more cost-effective setting while they’re away and reset it to a more comfortable temperature before they arrive at home. But the intelligence of a smart grid begins with smart consumer meters. Smart meters allow for two-way communication between PSE&G and consumers. This enables the company to identify outages quickly and take care of other service issues, often without having to go to the customer’s home. Utility companies such as Pacific Gas & Electric (PG&E) believe that a smart meter program is the beginning of the creation of the smart grid. Companies like PG&E and PSE&G know that it takes more than smart meters to make a smart grid, but they see smart meters as a “toe in the water” before making a total commitment. 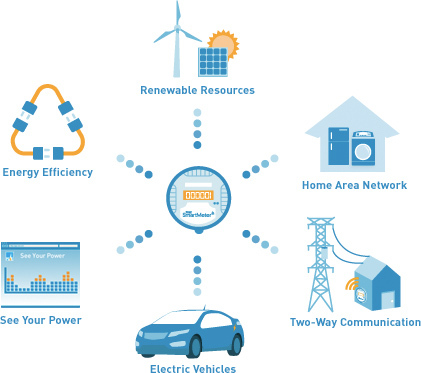 Achieving a smart grid will happen incrementally and in small steps, and connecting with IoT makes it easier for utilities to connect to equipment and technologies not yet in existence. Mr. Akers is correct, and the IoT is the force that can help do this. To learn more about digital transformation for utilities, see Utilities: Reimagined for the new economy.